I don’t usually use this space to encourage you to watch more TV. I’m more of a get-out-and-do-things-with-your-community kind of councilmember. But I will make an exception for The New Los Angeles, which I saw at a special premiere event last night and which will be shown on KCET Thursday night, April 27, at 10 pm. 225 years ago, 44 pobladores, settlers of different races, set out for a long walk that ended on the banks of a river. They founded a city and they called it Los Angeles. Their long walk continues today. 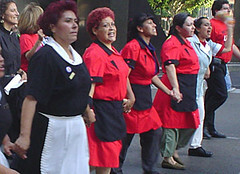 It continues in the marches of the janitors and the housekeepers in the streets of our city. It continues when men and women climb the steps to city hall to petition for a living wage law to treat the city’s workers fairly. And it continues as immigrant workers pace their own precincts, rousing the "sleeping giant". Of course, the movie was completed before the commencement of these historic protests against the criminalization of immigrant men and women. But clearly, the three-quarter-million strong in our streets are walking the same walk—towards justice, inclusion, and a new Los Angeles—as the pobladores 225 years ago. from the U.S. Department of Justice, Office of Juvenile Justice and Delinquency Prevention. Secondary Prevention: Identifies young children, ages 7-14, at high-risk of becoming involved in gangs and juvenile delinquency. Intervention: Targets active gang members and their close associates ages 14-22. Reentry: Targets serious and gang – involved offenders who face multiple challenges to reentering their community. Suppression / Community Law Enforcement and Recovery Program (CLEAR): Gang leaders are targeted for aggressive suppression efforts. Too often, when we say the words "public safety", it's as shorthand for police and fire. It’s easy for us to say those words and get people to think about men and women in uniform, who come after the fire starts, who show up at the scene of the crime. But no one knows better than the men and women who put on the uniform that safety only comes from involving the whole community. At the news conference, I tried to address the young people there directly. To them , I said that safety means a community where you have an adult you can talk to when you fear that someone wants you to join a gang. Safety means you have a school where you can learn, and a job that, when you hit working age, lets you learn skills and see how you can become an adult in the society around you. Safety means that when you recognize your mistakes, your community still recognizes your humanity. That last point is something that we are still learning how to do. We have had success in california at reincorporating parolees into our communities, allowing them to prove that they can turn their lives around. The recidivism rate in california was at 40% in 2003, lower than it has been in a quarter-century. It’s vital that the gang reduction services will be provided by people like Father Boyle who are rooted in this community. In CD13, I have seen the Aztec Fire Crews work with young people at risk of joining gangs and show them their own bravery. This is my message to the young people who are the target audience of this program: Many of you are looking for your toughness. You are looking for the hardness in your heart, because you think you need hardness to protect yourself. Our promise to you is to show you that with your hearts open, you can see that you are much more than tough: you are brave. It's been clear from the recent protests that Los Angeles is going to take a leadership role in any national discussion of immigration. When I attend meetings of the National League of Cities, I'm always looking for answers to the issues we're grappling with as a city; one of the most pressing ones has been how to deal with the congregations of day laborers, mostly around home-improvement superstores such as Home Depot (but also at moving companies or smaller hardware stores). More often than not, I find out that other cities are looking at Los Angeles to see how we deal with such issues. It's clear that the vast majority of the people who show up there want to find work, but the sites often attract a small minority of loiterers, some drunk, some just...disorderly. Often, the crush of people seeking work can cause traffic jams or accidents going into and out of parking lots. Our city has chosen to deal with this as a public safety issue, taking into account the rights and interests of customers, residents, and the laborers themselves; unorganized, they are subject to extraordinary abuse, exploitation and often injury at work. We also believe that it's the responsibility of the stores themselves, especially when they are on the scale of a Home Depot, to help address the problem. In CD13, the biggest center of day laborers has been at the Home Depot at Sunset and St. Andrews. For years, there was a day-labor center in Hollywood about half a mile from Home Depot; it was used by people who knew it was there, and it provided organized access to labor for the workers and customers who used it, but since it was so far away, many just showed up at the site unorganized, defeating the purpose. Day Laborers are even working with neighbors to clean up trash and arrange for bulky item pick up. As early as December of last year, we had counted that 52% of registered workers get hired each day, 90% of employers are going to the Center rather than picking up workers at the corners, and 2/3 of workers are going to Center rather than hanging out at the corners—and that last number has ticked upwards since then. Earlier this year, Dr. Abel Valenzuela at UCLA released a study that captured in detail the lives, work patterns, and economies of day laborers. From UCLA's promotional material: "Interviewers asked about the workers’ educational backgrounds, family lives, occupational histories and experiences as day laborers, including injuries sustained on the job and the nature and frequency of abuse at the hands of employers, merchants, police and security guards." The full study can be downloaded here. It's worth checking out to understand the lives of a part of our society, and to understand one way in which Los Angeles will set the terms for our national discussion. Making L.A.'s commercial office buildings more "Safe and Secure"
Jack Weiss and I have co-sponsored a proposal to improve public safety at commercial office buildings by strengthening coordination between first responders and improving training and retention of private security officers. 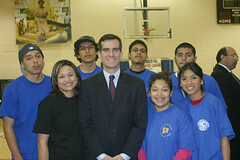 The program picks up where a voluntary program that was much discussed in council last year, "L.A. Safe and Secure", leaves off. 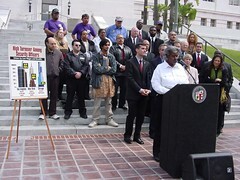 We were joined in the motion by Councilmembers Herb Wesson, Janice Hahn, Wendy Greuel, and Alex Padilla. And in developing our approach to this issue, we've been helped immeasurably by the attorneys in Rocky Delgadillo's office. In legislation as in life, you have to hope for the best but prepare for the worst. While a few commercial office building owners have risen to the challenge of improving security after 9-11, there are weak links in our chain of security. As lawmakers, we have no greater responsibility than to ensure the highest security possible for the men and women who live and work in our city, and improving the training of security officers in commercial office buildings will go a long way towards making sure that, in a disaster, police and fire will be able to coordinate efforts with the men and women who know the buildings best. As Jack Weiss pointed out at the press conference, private security officers are the first line of defense at some of the region’s most attractive terrorist targets. We have to ensure that security officers have the necessary training and experience to fulfill this responsibility. We also want to address the issue of officer turnover. All the training in the world won't make a difference if turnover continues at high rates. A study by the Los Angeles Alliance for a New Economy (pdf) concluded that security officer turnover is at 243% in L.A.'s commercial real estate. By contrast, in Chicago, where security officers are unionized and have medical benefits, turnover is nearly ten times lower. The proposal will be discussed in the our Public Safety and Housing, Community, and Economic Development legislative committees. I'll let you know how it develops. 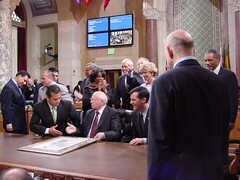 It was a tremendous honor to host Mikhail Gorbachev in Council chambers on Wednesday. The Mayor joined us to present the former Soviet president with a city scroll honoring his international work on the environment. While Gorbachev was in chambers, I introduced a council resolution that, if passed, will put the city on record in support of Global Green's Energy Shift campaign, in advance of the G8 summit to be held in St. Petersburg. The greatest energy security challenge facing humanity is the implementation of clean energy solutions for sustainable development. By exponentially increasing the generating capacity of clean energy sources around the globe, the G8 can work to mitigate Climate Change and provide energy to the world’s poorest people. Leveraging an unprecedented clean energy and energy efficiency deployment is the only way to achieve real, lasting energy security. Los Angeles and California have consistently led the way on environmental standards, persuading the rest of the United States by word and by deed. When the reso comes before full council, I hope we will continue that tradition by adding our voice to Global Green’s as they lobby the G8 for sustainable energy security. At 3 pm on Tuesday, April 5th, and next week on April 11, the Education and Neighborhoods Committee, chaired by Councilmember Alex Padilla, will hear testimony and make final recommendations on the Neighborhood Council Review Commission, which many of you know as the "912 Commission". These recommendations will be sent to the full council for discussion and adoption at the end of April. In these sessions, the committee will focus on setting the process for appointing members to the 912 Commission and crafting the commisssion's scope of work. Once it is in place, the commission will review and evaluate our great neighborhood council experiment from top to bottom. If you've got something to say about where neighborhod councils shine or where they could use improvement in empowering and giving voice to communities, please speak up at one of these two hearings. More information is online at www.lacityneighborhoods.com. Councilmember Padilla's office may also have information, and you may always reach my District Director of Community Development, Shane Goldsmith, at (323) 957-4500 or via e-mail.